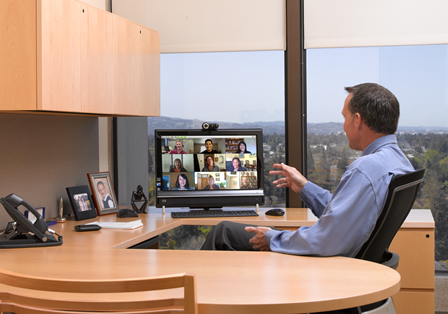 As video conferencing has continued to evolve throughout the years, it has grown to become the chosen method of communication for forward-thinking businesses across the globe. However, up until now one of the drawbacks associated with video conferencing was the initial financial outlay required. Video Conferencing as a Service (VCaaS) has changed all that as it allows organisations to benefit from leading-edge VC technology with only a relatively small capital expenditure. Therefore, it is no wonder that more and more businesses are choosing this method and reaping the rewards that VCaaS offers. To understand how VCaaS could benefit your organisation, contact us to discuss your requirements. With the benefits of video conferencing clear to businesses, such as a reduction in travel time, improved workforce productivity, better global links and accessibility, the cost of infrastructure has made this option prohibitive for some organisations – until now that is. With the rise of VCaaS and video delivered via the cloud, companies can harness the power of video conferencing to enhance productivity without the high price tag. Businesses now have the option to add business quality video into their organisation without the infrastructure cost and maintenance worries. Companies still need to ensure that they are choosing the right solution for their business, and that is where we come in. Designed to deliver a fully featured video conferencing network on a flexible basis, VCaaS can bring the benefits of a high quality VC service to your organisation without the need for significant up-front investment. Access to infrastructure is provided by the VCaaS platform. This includes video bridges, gateways and firewall traversal as a monthly subscription, for use with existing hardware or software endpoints. With the surge in popularity of video conferencing systems expected to continue, the emergence of VCaaS represents much more than just a passing trend. As a market leading supplier of video conferencing systems, Videonations can provide you with expert and impartial advice on choosing the appropriate solution. Although VCaaS is a significantly more cost effective option compared to traditional video conferencing systems, there is no need to compromise on quality. The most obvious difference is the price tag.